My week at the 2016 Mobile World Congress (#MWC16) in Barcelona is wrapping up… so much to talk about! 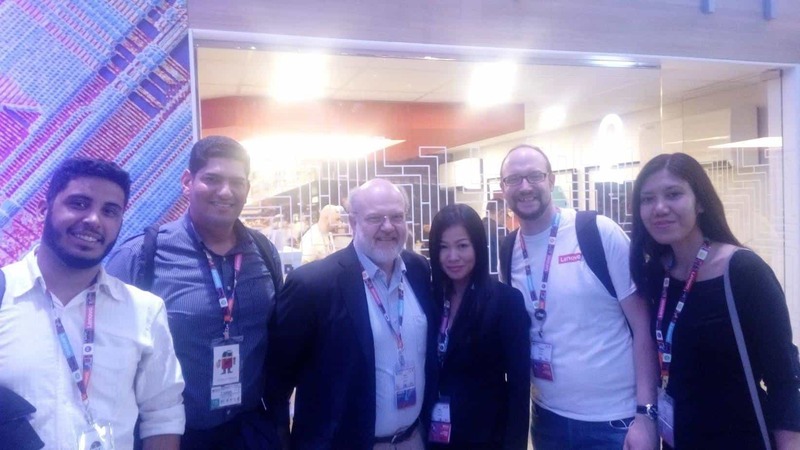 I attended the conference as one of a handful of people selected as a Lenovo INsider, a group of Lenovo superfans with a diverse background ranging from technology to social media. · A major highlight for me was the opportunity to interview Lenovo’s CEO, Yang Yuanqing (YY)! He was very kind sharing of big visions for the future of Lenovo. YY is leading the company that is redefining how we use our devices and interact with technology at work, at home and everywhere in-between. He is the well-deserved winner of the Edison Award for the innovative products at Lenovo, which just keep getting better. · Our INsider team had a wonderful time dining with Rick Osterloh, President and COO of Motorola. He was beaming when speaking about the future of Motorola, which is now part of Lenovo. Check out the Moto 360 Sport, the Moto X Force or Moto X Style, just a few of the new line of Moto phones with some serious fun and big technology behind them! · I also learned about Lenovo’s strategy and products during my interview with SVP Xudong Chen. He was so full of life, I can’t believe how cool all of the Lenovo employees are! With executives like this I can see why they attract great talent. · The Lenovo executive that may have the most fun job was David Roman, Chief Marketing Officer. He’s the brains behind launching and marketing all of Lenovo’s products. It was great to interview him and to see how in-touch with social media he and the rest of the team are at Lenovo. · George He and Peter Hortensius are two Lenovo executives and geniuses behind their technology, cloud and ecosystem. Our INsiders group had a great time sponging as much knowledge as we could from our hour-long session on the future of innovation and technology, right from two leaders behind it. What an honor! · Connie Bryant was another dynamic person to interview and learn from, as she heads up Lenovo’s Apps. Apps were everywhere at this conference, and the REACHit, WRITEit, SHAREit apps that Lenovo launched simplify and elevate experiences in all areas of life. This is really exciting stuff, from being able to remote access to your PC from anywhere, to a real-time handwriting-to-text converter. The Lenovo booth was booming the entire conference, definitely a highlight for so many conference-goers. The setup matched the products and was, in a word, vibrant! I especially loved the projection room for the Yoga tablets, and the water tank showing Lenovo’s durable products (I even saw some underwater selfies going on!). The conference as a whole was an absolute blast. Stay tuned, once I get back from this gorgeous city of Barcelona I will share more from my first look at the best in everything mobile! I am not familiar with Lenovo. I’ll have to look into the technology. Marianne, go to http://www.lenovo.com and I think you’ll be impressed! The first time I had heard of them was when my husband’s company switched from using Dell to Lenovo about 4 years ago… they never looked back. I’m typing on a Lenovo laptop right now. I love it so much that I also bought my sister the same one. It’s a great laptop for a great price and I’m happy with mine. Awesome, yes my husband loves his laptop too. It’s lighter and less expensive but actually packs more punch than the competitors. Your week does look amazing. It sounds like apps were big at the conference. Yes the apps were a big part and really exciting / inspiring. All of the social media giants were there, too. I am using a Lenova laptop right now. Fabulous brand. Your week looks amazing! That’s cool, sounds like those of you already using Lenovo products are really happy! I would love to own a Lenovo lappy because of the good reviews I have been reading about this product. Cool event there. Haha love that, “lappy”. Yes they are killing it as far as reviews! The under water selfies sound so fun> I need to look into a Lenovo laptop. Never heard of Lenova laptop will have to check it out. The reviews are great thanks for sharing. Yes definitely, keep them in-mind. Based on other comments from this post, my personal experience and all of the people I spoke to at the conference they make amazing laptops. I have never heard of them before but I like how you were given five star treatment that is lovely! Most people have heard of IBM laptops and Motorolla (Moto) phones, and those now roll up to Lenovo! I had a Lenovo laptop once and it worked well enough! That’s cool, thanks for sharing! Check out their tablets sometime too. My current laptop is a Lenovo and I love it. Awesome. What do you love about it? I’m always curious to hear why. Lenovo has been upping their gadget game for a couple of years now. And I have to say they have been very impressive. It looks like you had a fantastic week! I agree, they are for real and everything from picture, sound and all of the groundbreaking extras are making their newly launched products really stand out. I thought their booth had the most buzz at the conference. What a spectacular event for you to experience. Sounds like a good time with many ideaas. Thanks Debbie, I had to pinch myself about 50 times a day, couldn’t believe it happened! This looks it was great opportunity. I love learning more about brands. Me too Milena. There was more to learn at this conference than anywhere I’ve ever been… I just scratched the surface. My first time to Spain. I loved everything about it! What aan amazing event to get to attend. I love to see how much technology changes and improves every year. Yeah it’s pretty crazy Tammilee how fast this stuff evolves. At car shows you get to see concept cars that might launch in 5 years, if ever. At the MWC you get to see technology that seems like futuristic concept stuff but it’s launching now, for all of us to use. It’s so exciting. I’ve heard about this event, it’s great that you had an opportunity to visit and meet these awesome people! Thanks Katarzyna! The people at Lenovo were all so friendly and eager to share, it made the week so amazing. What an amazing opportunity for you!! Lenovo is a solid company with quality products! Congrats! 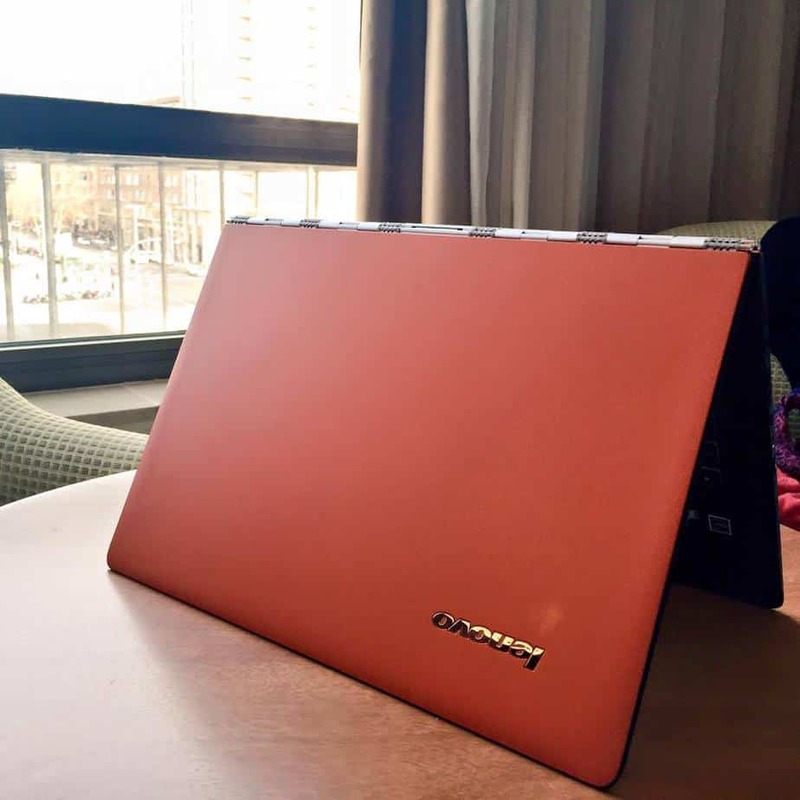 I did a blogging campaign for Lenovo as a tastemaker and I was fortunate to receive the Yoga Pro 3. I love it til this day! I am so excited for you because Lenovo definitely has a lot of innovative products! Congratulations! What a great experience! It looks like a great place and venue! It’s always fun when collaborating with a group! I saw a few of these pictures when you posted them on Facebook! Looks like a wonderful week and lots of new prodcuts! What a fun experience. I love learning about new technology. I would have loved eating dinner with the big guys and learning what the inspiration was behind their new apps. That is neat that you got to chat with the ceo. I know my husband could use a new laptop. Wow! What an amazing opportunity you had! Shows what social media influencers can do these days! Very motivating! I see some of the readers have Lenovo, so it must be making its mark! Will have to do some research on it! How exciting! Before I upgraded, I had a Lenovo computer for years. It was a workhorse. What a great experience and opportunity! I hear that Barcelona is pretty amazing too! I have heard so many great stories about the LEnovo! I would love one to do some work on! Looks you have a great time! Great experience. So exciting! I absolutely love my Lenovo laptop! It is so much more reliable than my brand new desktop! It looks like you had a wonderful time! Funny I am seeing this today…my Mom and I were at OfficeMax today and she was asking me about the Lenovo brand. Looks like you attended a tech-lovers dream of an event – lots of cool stuff…and very nice to meet and greet with the CEO. I have heard about Lenovo and have been wondering if I should get a laptop from them. I am saving up. I really need a good laptop.